Our aging eyes had no trouble at all picking up the very bright 10 MOA dot. A minor nit with the Zoom Dot was the placement of the windage adjustment. It’s partially blocked by the scope mount in its ‘factory shipped’ condition. This was a minor inconvenience at the range. While the Zoom Dot claims water resistance, we did not have any 200 foot free dives planned during the evaluation period to test it out. Maybe next time..
Zoom. Zoom. Zoom. 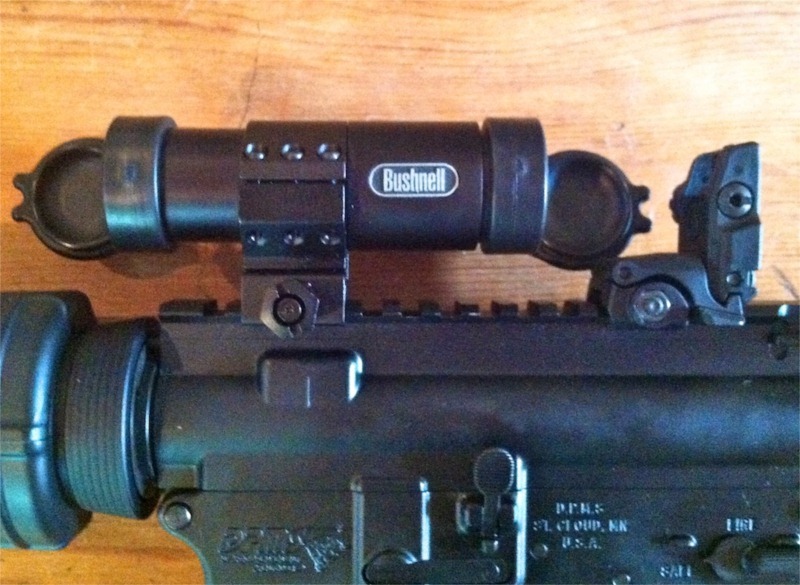 That’s Bushnell’s approach to balancing rapid sighting capability with precision aiming in the same optic. Some optics makers elect to use a single red dot, an arrow, or a small MOA dot surrounded by a larger circle for close in and fast sighting. The Bushnell Zoom Dot approach is just like the name says – a variable zoom control knob increases the red dot size from 1 MOA all the way up to 10 MOA. Just for scale, that would mean the largest dot setting dot would just about completely cover a paper plate at 100 yards. Zoom is controlled by a large control knob on the right side of the tube. This control knob also serves as a battery disconnect for long storage periods of inactivity and houses the units battery. 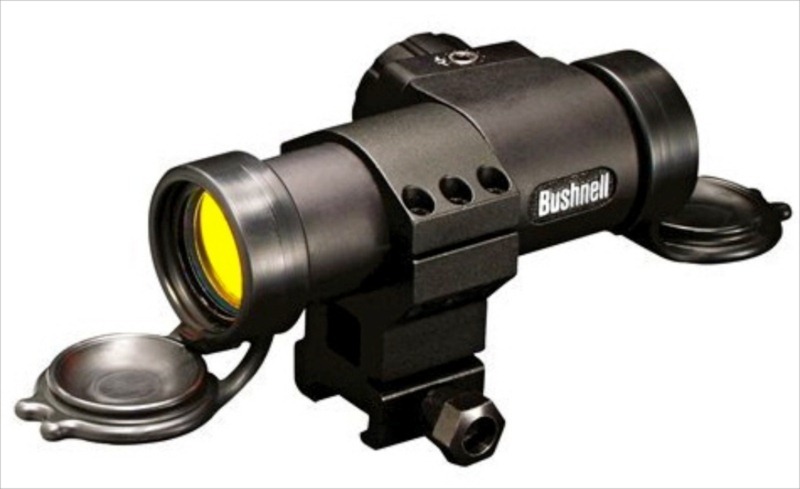 The Bushnell Zoom Dot comes with rubber flip-up lens covers, and in addition to keeping dirt, grit, slime, and meddling politicians away from the glass when not in use, the covers serve a secondary purpose. The Zoom Dot is equipped with an automatic brightness adjustment. An onboard sensor detects light conditions and intensifies the dot accordingly. Outdoors, the dot gets brighter. Indoors, the dot gets dimmer. Best of all, when the lens covers are closed, the dot turns off altogether, thereby extending the battery life to thousands of hours. We’re leaving the unit turned on at about the 5 MOA setting just to see how long it will run. If the battery outlasts our patience with presidential election primaries, we’ll consider it a victory for all mankind. The Zoom Dot has a rock-solid six screw mount. However, when we went to make our very first windage adjustments at the range, we found that the factory default mounting position was too close to the windage adjustment and the adjusting hex wrench was not able to fit. So we had to loosen the mount, move the mounting ring further from the control area and re-seat the mount before we could make windage adjustments. Not a deal breaker, but it was unusual that you’re not able to make sight adjustments with the out of the box configuration. So your options are to move the tube permanently in the mount, allowing for future windage adjustments, or move the tube, adjust for windage, and move it back. The included lens caps are made of a rubber material. The optic has ‘nubs’ that will hold the lens cap in the open position. A firm push flexes the rubber cap back over the nub to close the cover. Nice touch. The rubber lens caps are mounted on a ring that can be rotated around the tube, so the covers can be positioned to open up, down, sideways, or diagonally if you’re feeling particular rebellious. Judging by the cornucopia (a ‘cornucopia’ is about two and a half boatloads by the way) of gun, ammo, and accessory products hitting the market, zombies are everywhere. This is a good thing as we thought a reasonable durability test would be to red-dot whip a few dozen of the undead to make sure the Zoom Dot lived up to its sturdy appearance. Unfortunately there were no undead to be found in our area. Nor could we find any rapists at local Occupy events as a substitute target. 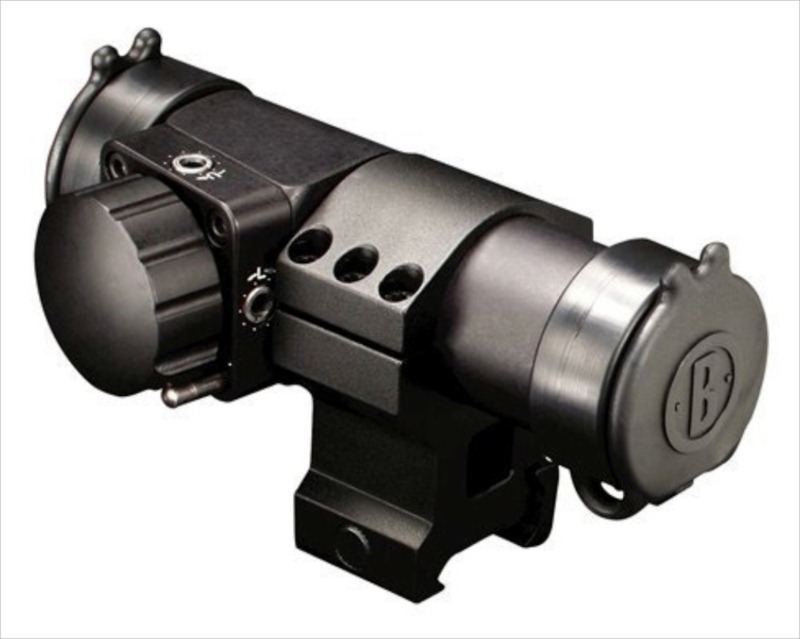 No matter – Bushnell claims that Zoom Dots are in active duty use in Iraq and Afghanistan. We have been unable to verify whether the Zoom Dot is featured in Modern Warfare 3. The Zoom Dot is also fully waterproof to an unspecified depth. We were going to take up high-performance free diving and bring this puppy down to a couple hundred feet, but the water was a bit chilly, so we postponed that. Maybe later. The Bushnell Zoom Dot is intended to work with back up iron sights in the event the fudge hits the fan and your battery dies at an inopportune time. Our test platform was a DPMS Panther A3 Lite with a Magpul Back-Up Rear Sight and integral front sight. The height of the optic with included mount was a bit lower than we would have preferred as the optical sights lined up in the upper half of the tubes visible area. With the integral front sight of the A3 platform, we found the front sight to be too much in the field of view when using the optic. 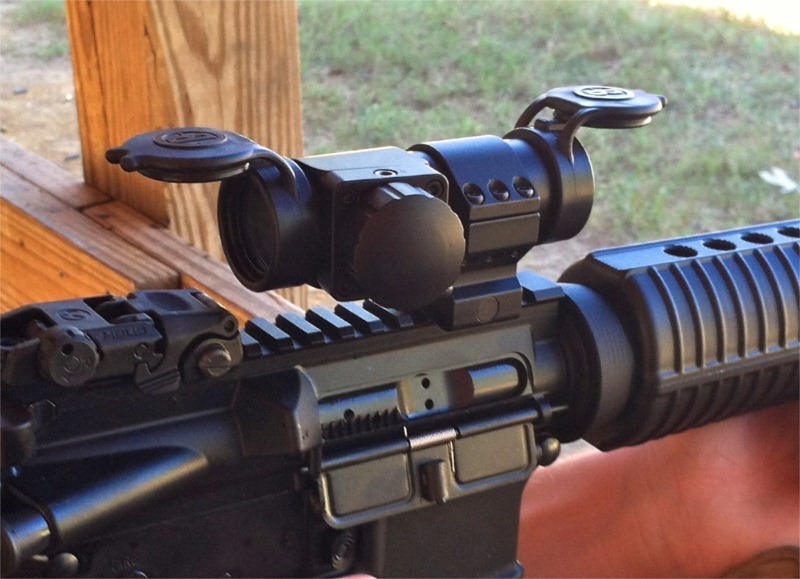 Of course, this would not be an issue with a fold-down back-up front sight setup. And if you’ve resorted to iron sight use, the height is irrelevant as you can see clearly through the glass. if the mount height really bothers you, the tube is a standard 30mm diameter so the mount can be replaced with one a bit higher. We did most of our shooting at ranges between 10 and 100 yards. At 100 yards, the smaller MOA settings (1-3 range) were perfectly adequate to consistently hit clay targets and other small objects. For 25 yards and closer, we liked the higher settings, maybe in the 5-8 MOA range. Going with a larger dot size in bright sunlight was also helpful. While the dot intensity automatically increases in bright light, the optical illusion of even greater brightness with larger dot sizes was helpful. The stand out feature of this optic was its feeling of solid. No, we didn’t drive nails with it, mainly because Paul at Bushnell might have used it on us if we beat the heck out of his red-dot. Nor did we have the opportunity to AR-whip any zombies with it, but it just feels substantial. We’re going to keep it on for a while and run it through the paces of several high school shooting club outings. 25 or so teenagers using it at the range should be roughly equivalent to a year or so in a combat zone. That ought to provide some real world perspective and we’ll post updates as appropriate.